This was supposed to be completely different then how it turned out, there were going to be more pics in it but then I just decided to leave the main focus on Kiba so wa la this is how it turned out. Let me tell you there was alot more small little spaces to vectore then I thought there would be. Wow. ^_^' So glad I'm done with it. Well gotta go cya. I love this kind of art! It's simple, but it's enough! Touches our eyes with its softness and impress our mind on the subtle details! love it. ^^ keep it up! I love how everything blends. ITS KIBA ! 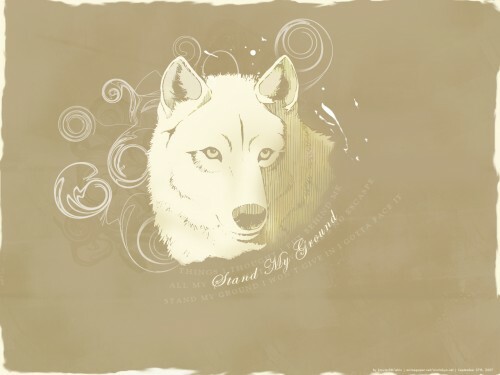 Im such a big fan of Wolf's Rain and u did this drawing really well and itz amazing , especially the background . Cool, the simplistic touch is better than if you had added any extra images. It would be perfect if you could re-upload this with the corrected typo of "escape" as mentioned by the user above me. Nice....it has a clean look! Really good :) Great job! I love this! I like the image and the colour, it's very artistic! ?